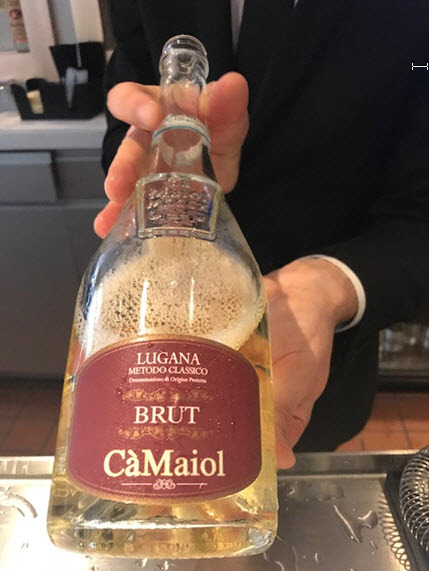 A luncheon and wine primer hosted by the Consorzio Tutela at Café Milano proved to be the perfect setting for learning about the wines of Lugana DOC. 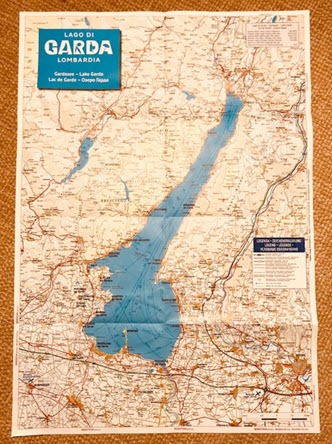 This wine-growing designation in the province of Brescia, is situated in the southern part of the beautiful Lake Garda in Northern Italy, 150 miles east of Venice and 150 miles west of Milan, and southwest of the Dolomite Mountains. The volcanic soil of clay and sand is rich in mineral salts, and the lake, which was formed from a volcanic eruption 10,000 years ago, supplies 30% of its fresh water to all of Italy. This area also has the advantage of being warm enough to have olive trees with a Mediterranean climate. Perfect for the grapes too. 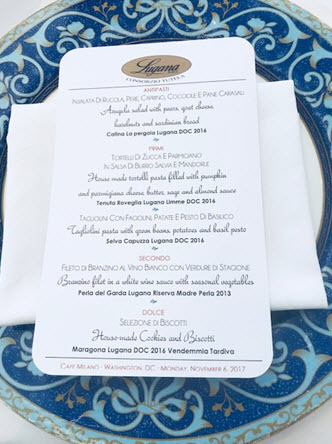 As a travel destination, the Lake Garda region is hugely popular with tourists and many of the wineries have their own restaurants, bars and lodging. Cyclists can ride around the circumference of this picturesque lake taking in water views and visiting wineries along the way. Currently the largest market for this thick-skinned grape is surprisingly Monaco. Following that their largest audience of consumers is Germany. And though the winemakers have seen a ten percent increase in production per year for the past ten years, there were only 15,120,133 bottles of these extraordinarily expressive produced in 2016. Due to the fact that there are only 4,628 acres in vine, it is the most expensive white wine in Italy. Genetically the Turbiana grape is distantly related to Trebbiano di Soave and is a distant cousin to Verdicchio, but don’t let that distinction define its profile. After tasting a dozen wines from the region, made exclusively with this single grape, I can say that it has stunning versatility, as well as affordability. There are a number of expressions of this grape and they are all very individual. They range from soft and floral, fruity to crisp, lemony and herbaceous and even sweet as in the late harvest wines. And most of the wine is made un-oaked. 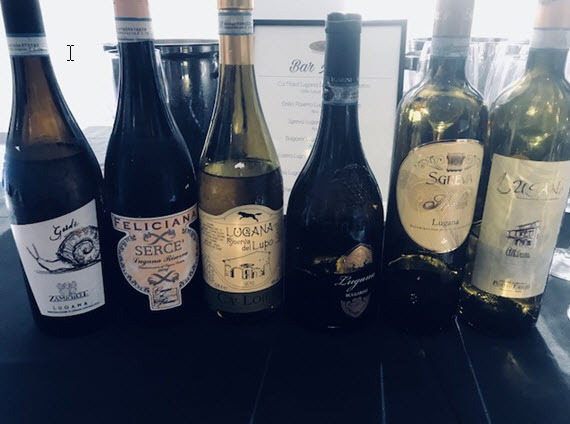 The basic Lugana is fruity and dry and is rarely exported; ‘Superiore’ requires one year of aging to mature; Reserva is aged for 24 months – six months in bottle; the late harvest Vendemmia Tardiva is only made by three wineries; and the very lovely Spumante is in limited production. That said, it is finding its way into some of the finer restaurants in our area. 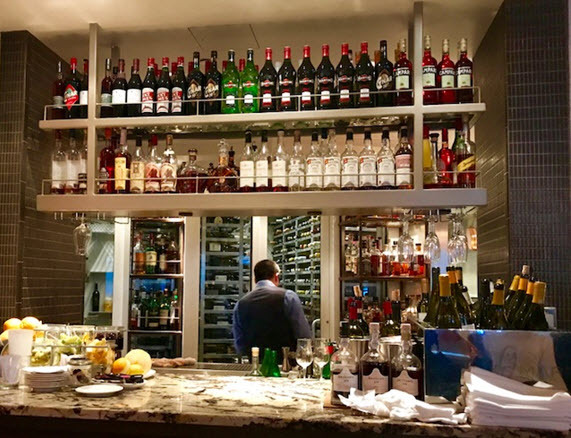 One of the most recommended restaurants in Metro DC is Fabio Trabocchi’s Fiola Mare. Along with his wife, Maria the dynamic duo has launched five of the most successful concept restaurants in town. Here the thrust is seafood – freshly caught, sustainably raised and served with an elegant Italian flourish. 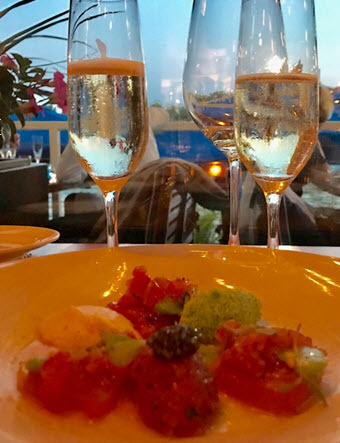 It is everything you’d dream of in a posh seafood restaurant in coastal Italy. Situated alongside the Potomac River on the Georgetown Waterfront boardwalk, its sea blue awnings beckon diners to this nautical themed restaurant. Inside bistro chairs are fitted out with white piped, navy blue cushions, just what you’d expect to see on a luxury private yacht. Windows open out to take in the view of Kennedy Center, and a nearby park is the perfect spot for an after-dinner stroll. It’s a lively place, not conducive to easy table talk, but the large, narrow dining room sporting cream colored banquettes is arranged to see and be seen. Even the bar, stocked to the ceiling with aperitivos like Cynar and Campari, has a clear view to the main dining room. A smaller room with coffered ceiling, paintings of sailboats, and a marble-topped bar looks to be perfect for private parties. Dinner began with a pair of ‘Bellagio’ cocktails and a quartet of raw tuna, caviar, sea urchin and foie gras mousse. It merely whet our appetite for more. 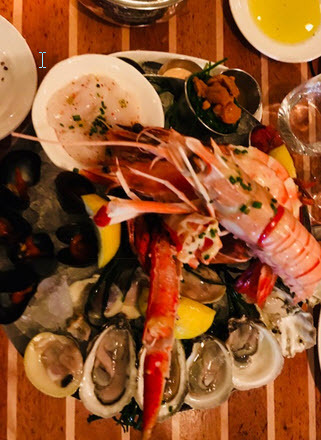 Our server suggested we order the ‘Ancona’ – – Madagascar shrimp, clams, oysters, scallops, mussels, bay scallops, king crab, langoustines and more tuna tartare. Who could say no? 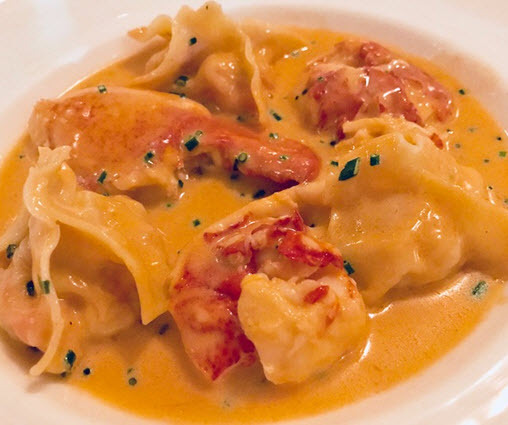 One of Trabochi’s best known dishes, is his Lobster Ravioli. There is a reason for this. The pasta, nestled in a delicate sauce, is as sheer as a silk stocking and what lobster the ravioli doesn’t accommodate within, is added to the final dish. It is deluxe…and it is legendary. We followed that with pan-seared fish, whose heritage I cannot now recall, but it was served on soft polenta with baby zucchini. I’m fairly certain that was the only vegetable I made contact with all night. 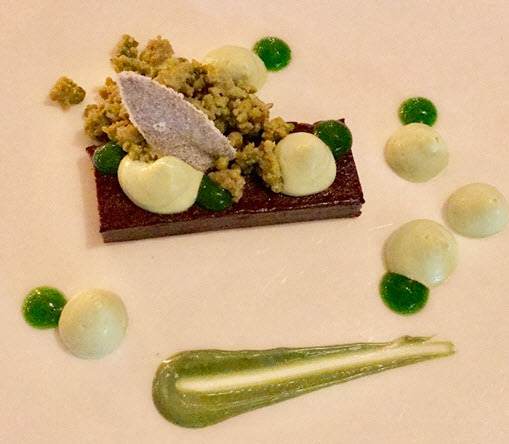 Allowing for a dessert to share, Pastry Chef Christian Capo created an exquisite terrine of dark chocolate with pistachio gelee and pistachio mousse that I am still dreaming of. The name alone is enticing, conjuring up exotic images of the day of the week best known for relaxing. But it’s not just the name that lures me to the regional Vietnamese dishes in this hip, welcoming atmosphere. It’s as much that as the owner’s attention to detail. 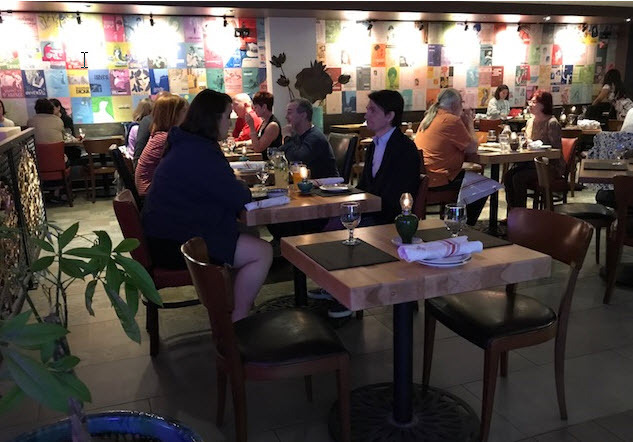 French rattan bistro chairs and wide umbrellas welcome outdoor diners while a cozy, carpeted nook for hanging out in wing-backed chairs offers a plush respite while waiting for your table. There’s even a tech-savvy card-operated wine automat for sampling a rotating selection of wines in ounce increments. Help yourself. Even the décor shows a personal touch with Asian antiques, moth orchids and a feature wall of brightly colored sheet music and album covers from the 1960’s through the 70’s. These almost Pop Art covers from the owner’s private collection derive from controversial love songs that came out during the Vietnam war and were outlawed by the Communists until 1975. 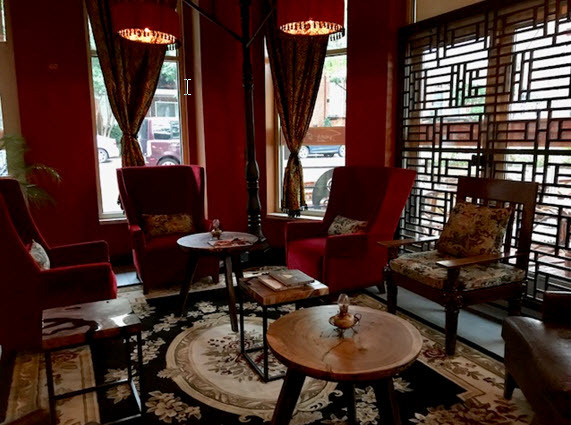 Owner, My Kieu Huyhn, of Café Banh Mi, a tiny spot on Cameron Street in Old Town, opened this more elegant, spacious spot in June in the former Teaism beside the Old Town Trader Joe’s. “Mimi”, as she’s called, aims to showcase a modern Vietnamese aesthetic using higher end ingredients in traditional dishes. Here you’ll find unusual offerings like Pho Bo Wagyu – Wagyu Beef Pho in Oxtail Broth; Com Tay Cam Chay – incorporating seitan, lotus seed pumpkin and rice prepared in a traditional clay pot; Canh Chua – a Viet bouillabaisse with prawns, salmon, pineapple and tamarind. 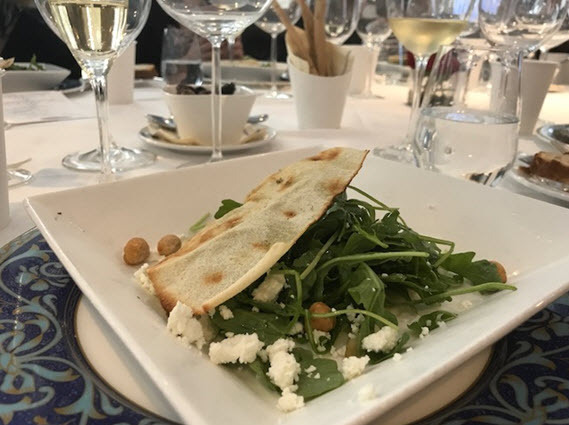 For a refreshing and filling salad try the Tom Hum Xa Lach – lobster salad with avocado, mango, and hearts of palm with a delicate passion fruit vinaigrette, or go with a version of the Saigon seafood pancake, here called a ‘Vietnamese crepe’, that’s loaded with shrimp and veggies. Options for sides include coconut rice, brown rice or black rice. 682 North St. Asaph St., Alexandria, VA 22314. For more information visit www.SundayinSaigon.com or call 703 549-7777.
honeygrow’s monthly list of local farms where ingredients are sourced. Hmmm, I thought. 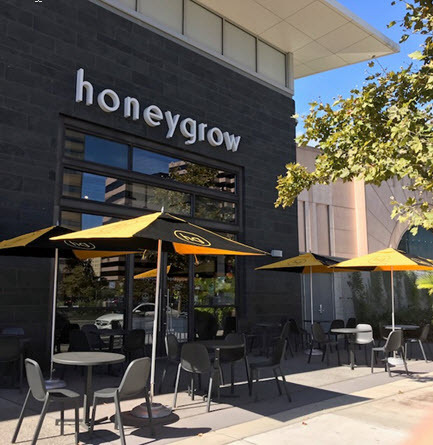 Honeygrow is an odd name for a restaurant. Then I learned it’s a contraction of ‘Honestly Grown’. And that defines the concept to a tee. 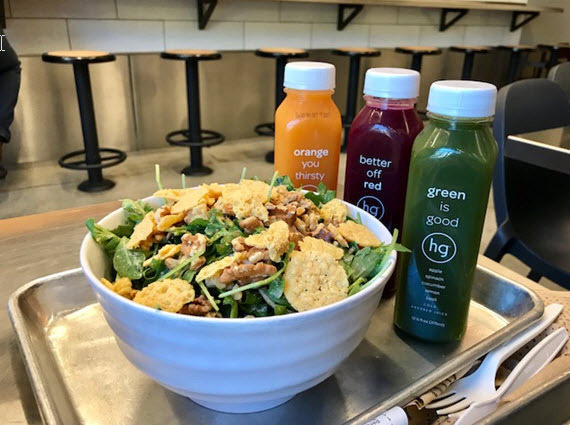 It checks all the boxes for eco-friendly – like sustainably grown ingredients (many organic), recyclable flatware and bowls, and locally sourced ingredients. That’s all well and good, you say, but how does it taste? 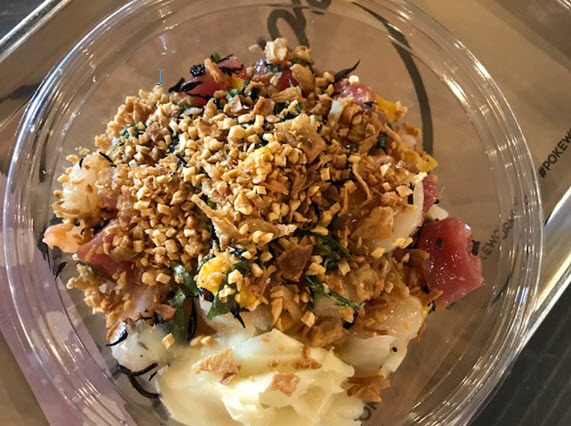 Well, here you’re the chef, customizing your order from a dizzying assortment of ingredients to create a bowl of healthy deliciousness. Just the way you like it. 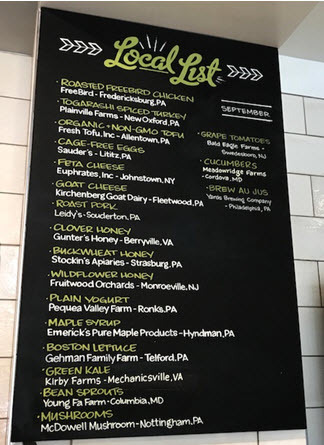 A wall-mounted chalkboard lists local farms cueing the diner to their place of origin. At the Pentagon City location (another outpost is in DC’s Chinatown), a few feet away from the Crystal City Ritz Carleton, it’s past lunch hour and a line has already formed for takeout orders. Though there is a section for dining-in, it appears most of the patrons have walked over from nearby offices to pick up their pre-orders. Security badges are ubiquitous in this area, and it’s fairly easy to discern government employees from mall shoppers – office dress and military uniforms vs. comfy casual. Initially, it’s a bit daunting with many options to choose from, but the menu guides the diner with a few basic ‘bowls’ featuring both cooked and raw options. From there you’ll tailor the finished bowl choosing from a raft of different dressings and toppings. 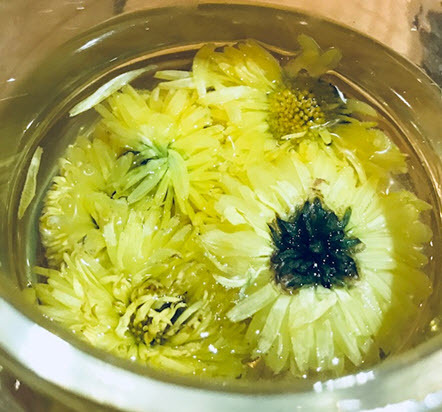 Dishes are primarily designed around Asian and Mediterranean themes with a guide to gluten-free, vegetarian and/or calorie count – if you’re watching your waistline. Proteins range from poached chicken and hard cooked eggs to bacon, turkey, spiced tofu or beef, nuts (walnuts or cashews), cheeses and legumes. There’s even a regional stir-fry or a create-your-own option. And all meats are all natural, antibiotic and hormone-free. High five, up top! 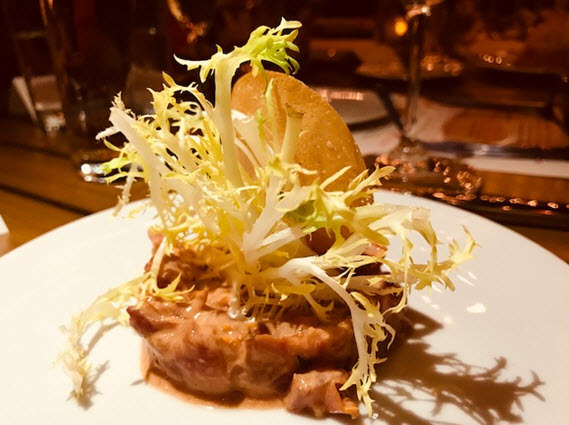 Culinary director, Chef David Katz, previously of Philadelphia’s award-winning Mémé and Creekstone Farms, carefully considers each ingredient offered, from sustainably raised meats to sauces and dressings prepared from scratch daily. Produce is always fresh (honeygrow eschews freezers). As for drinks the best choice is to go with the cold-pressed, sugar-free juices in to-go bottles. “Better Off Red” is beet-based with watermelon and raspberry; “Green Is Good” features apple, spinach and cucumber; and “Orange You Thirsty” blends oranges, carrots, ginger and lemon. They are all delicious and, of course super-healthful. We tried all three and each was refreshing with well-balanced flavors. Expect the same health-conscious dessert approach from this Philadelphia-based export. Opt for a base of fresh fruits topped with local honey – wildflower, buckwheat or clover – and top it with fresh cinnamon whipped cream or local yogurt, coconut, granola, ginger snaps or dark chocolate chips and you’re good to go. Clearly, a popular neighborhood spot, especially for those who embrace a vegetarian and vegan lifestyle. I’ve been to The Block six times. But I always go to Pokéworks. I’ve even got my little buy-twelve-get-one-free card to prove it. I haven’t written about them before because I wanted to keep it secret, but it’s too late for that. This spot is jumping day or night. Located in Annandale in a forgettable strip shopping center that features a K-Mart, a Korean bakery and a nail salon, it was a former Wendy’s, or so I’ve heard. You’d never know it. 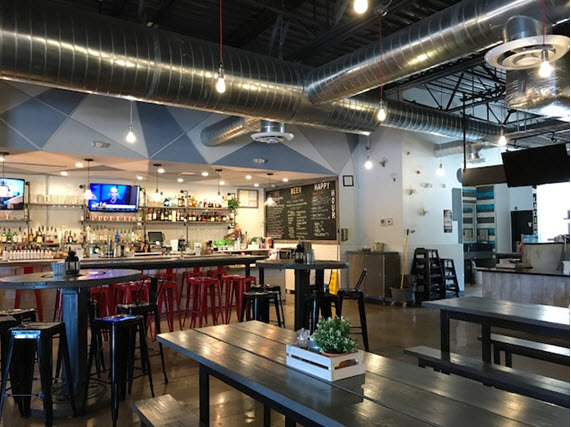 It’s since been redesigned into a stylishly industrial-hip open floor plan resembling a mini-food hall. 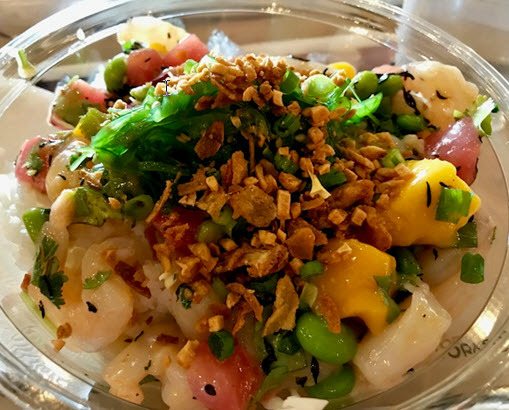 You’ll find three other counters – Balo Kitchen – Asian comfort food, Roots – Thai street food, and SnoCream, a Taiwanese shaved-ice shop with uniquely flavored ice creams. A bar with TV screens runs the length of the space, but at lunch time no one sits there. Communal tables allow for easy conversation amongst strangers and I’ve chatted up a table of middle-aged Chinese-American ladies, a Vietnamese-American gaggle of girls and a mother with teenage daughter who was off to LA for an acting gig who showed me photos of one of The Block’s nighttime themed parties and her sparkly, pink unicorn costume. From humble roots as a popular DC food truck, Pokéworks offers bowl or seaweed wrapped burrito options. 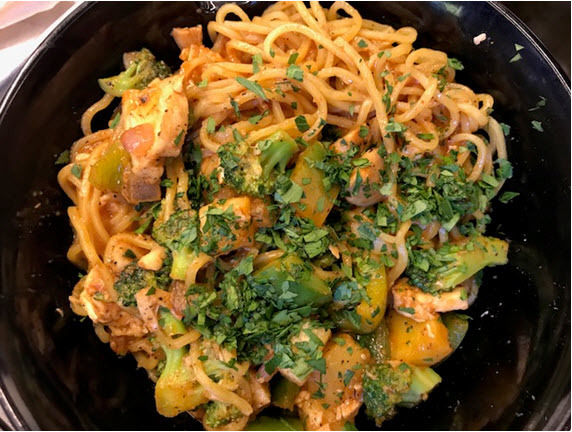 First choose from a base of kale noodles, brown rice or sushi rice, then select from two or three proteins (price increases only a dollar) – raw ahi tuna, raw salmon, raw albacore tuna, cooked shrimp, raw scallops, organic tofu or cooked chicken. Mix-ins are too numerous to mention here, but I am regularly drawn to edamame and diced mango. Eight different dressings are offered, but I like the ponzu or umami shoyu. Then toppings are applied. Avocado and wasabi tobiko are a bit extra, but the other eight are standard options. Lastly ‘Your Crunch’ is applied. 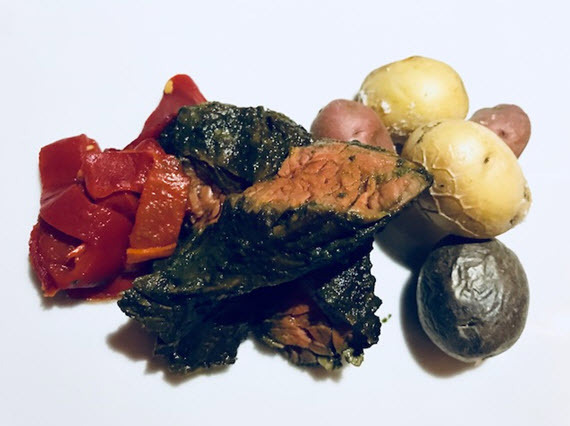 Choose from roasted macadamia nuts, garlic crisps, lotus chips, shredded nori and more. As many as you like. Enjoy. Just keep this cool spot on the down low. 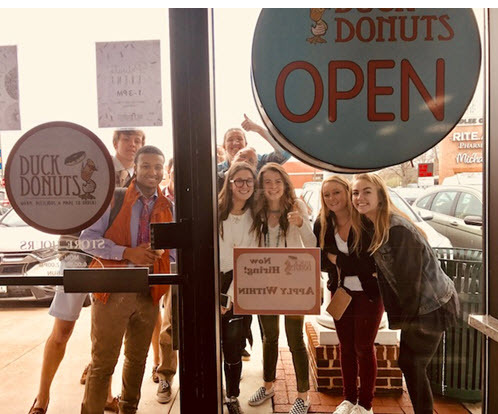 Russ DiGilio, founder and owner of Duck Donuts has rapidly expanded his Outer Banks shop into a franchise operation. Now with 12 locations in Virginia and Maryland, this unique donut concept allows guests to choose their own donut, base, icing and toppings – all made to order and served hot on the spot. Coatings go outside the norm with flavors like maple, peanut butter, strawberry, blueberry and lemon to underscore toppings – sprinkles, coconut, bacon and Oreo. Drizzles include hot fudge, blackberry, raspberry and salted caramel. 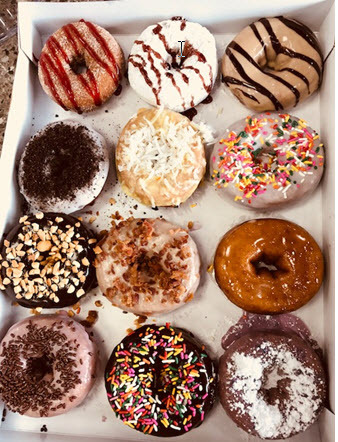 An assortment of Duck Donuts served hot! Red’s Table’s executive chef is nothing if not versatile. 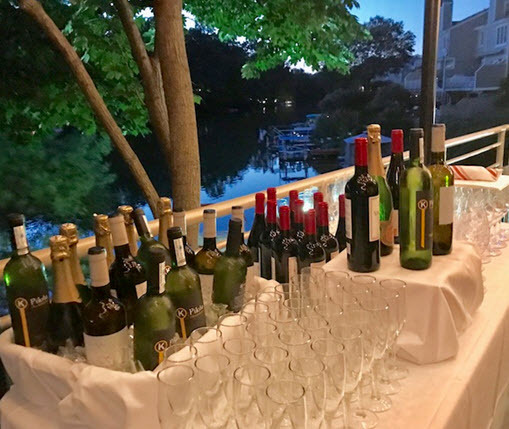 Definitely worth the drive out to Reston for a guided wine pairing dinner served outdoors on their spacious deck overlooking Lake Thoreau. The six-course dinner, complemented an ambitious dinner by Executive Chef Kevin Ettenson. 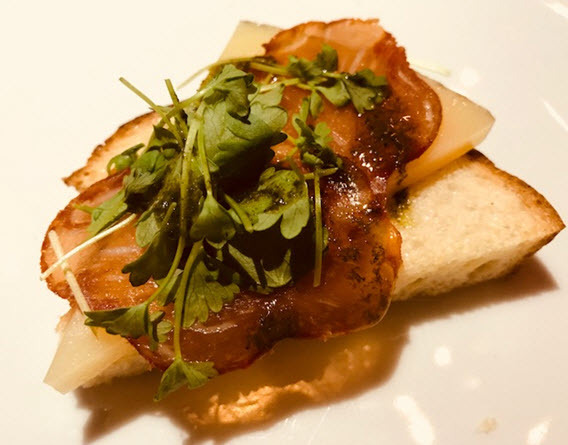 Because it was such an extensive showing of wine pairings I am listing them so that you can recognize some of your favorites – Cava Brut, Bodegas Murviedro Corolilla, Valencia, NV, Hondarribi Zuri, Bodegas K5, Pilota, D.O. Getariako Txakolina, Basque, 2016, Albarino, Adega dos Eidos, Eidos De Padrinan, Rias Baixas, 2016, Garnacha Blend, Casa Gran del Siurana, GR-174, DOC, Priorat, 2014, and Tempranillo, Dominio Basconcillos, Vigna Magna Seis Meses, Estate, Ribera del Duero, 2015. These sumptuous wines were served with jamon Iberico y membrillo crostini; tomate tartare; gambas al ajillo; conejo con Romesco; lomo de buey con patatas y piquillos; and a dessert of petits fours. Tell me you can find a better deal for $85.00 per person. To catch one of these special pairing dinners, make a reservation now for the upcoming Whiskey Dinner on Saturday, December 9th. For $85.00pp the evening’s offerings will feature both domestic and imported whiskeys over a four-course dinner. Five whiskeys from the U.S. and Scotland will be served to include – Bulleit Rye Whiskey, Bulleit Bourbon 10 Year, Ardbeg Corryvreckan, Oban, Glenmorangie Nectar D’or, and Glenmorangie Signet. Here’s the plan. Red’s Table is at 11150 South Lakes Drive, Reston, Virginia 20191. For reservations call 571.375.7755 or visit redstableva.com.